NEW YORK (MainStreet) -- The digital revolution has forced businesses and consumers to rethink their views on everything from copyright issues to the future of privacy, and now we may be witnessing the next big dilemma: How exactly do you make a digital collector's item even a geek would covet? Just 10 to 15 years ago, the question would have been largely irrelevant; consumers mostly stuck to buying analog products. Throughout the 2000s, though, consumers ramped up digital purchases to the point where e-books now outsell paperbacks, and more than 50 million digital albums are bought a year -- a fifth of all album sales. But while our consumption of digital products has changed, the way we assign value to them generally has not. Kindlegraph lets authors create a digital autograph to send to e-book buyers -- one way businesses whetting the interests of collectors online, where typically everything is the same. By definition, there is no such thing as a "first edition" e-book or an MP3 CD with a limited printing, since digital items can be duplicated an infinite number of times. There is no potential for one digital item to be worth more than another based on the condition it's in or the year it was made, since all digital items age the same -- that is to say, they don't age at all. In short, there is nothing that fundamentally differentiates digital products in a way that would qualify them as collectibles, at least in the way we traditionally use the word. "Digital information goods, such as music files, have traditionally been exact carbon copies of each other," says Vili Lehdonvirta, a researcher at the Helsinki Institute for Information Technology who studies consumer online buying behavior. "Even if you release a limited-edition version of a digital album it can be copied, and the copies are indistinguishable from the original." Several businesses are toying with ways to create digital products that mimic the feel of traditional collectibles, either by customizing the item for specific users to make it one of a kind or by imposing an artificial limit on the number of copies that will be sold and the amount of time for which it's available, to make the item seem rare. For a consumer, the main draw of a digital collectors item, like with any traditional collectors item, is simply to differentiate oneself from others, according to the consumer researchers we spoke with. To this one might also add that the collectible is seen as having more authenticity, an all-important word to the collector. "In the old days, one would limit the print of a painting to 10 or 20 copies because each would be seen as more authentic and closer to the person who created it," says Ravi Dhar, a professor of marketing and psychology at Yale University. "Things that are authentic are always seen as more valuable." That increased value isn't just important to the consumer, though; it is an essential component of the business model for many retailers, and one that needs to be addressed with digital products just like with physical items. "The reality is that more and more products will migrate into the digital world, and anything that can get digitized will be digitized," Dhar says. "So the question is, when this stuff does get digitized, how do we create a sense that one version is worth more than another rather than getting stuck in the commodity mindset that they are all exactly the same?" We picked out five businesses and artists who have created unique digital products customers may be willing to pay more for, or at the very least, that promote a closer engagement with the brand. These may just be what the collectors items of the 22nd century look like. Kindlegraph may be the closest thing we have to a specialty bookseller for e-books. 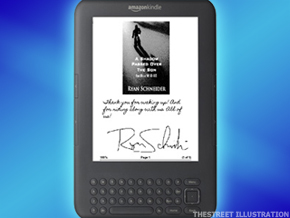 This online service lets authors create a digital autograph and inscription and send it directly to the consumer's Kindle through the wireless connection. "I got the idea because I would go to book readings, and I'd have the book on my Kindle but I wouldn't actually have anything for the author to sign," said Evan Jacobs, who founded Kindlegraph after having worked as a software developer at Amazon ( AMZN - Get Report) for 10 years. To date, Kindlegraph has partnered with 1,000 authors and offers users personal inscriptions for 5,000 titles, all free. The interaction between readers and authors doesn't stop with the inscription; Jacobs says he's working to make it possible for authors to send out sample chapters from upcoming books to those who have signed up as part of a paid subscription service, which would maintain that connection between writers and their fans. "In the physical world you have this collectible item and you can admire it and look back at it as a memento of when you met this person. Online, it's a memento of when you met the person, but it's also a gateway for connecting with them in the future," Jacobs said. Novels aren't the only literary works getting a digital makeover for collectors. In the future, consumers may hoard digital comic books just as they do physical comics. DC Comics has embraced the digital movement by making many of its comic books available on tablets and even going so far as to release the digital version of a comic before its print equivalent, testing the interest of its readership. Earlier this year the company went one step further and launched a short comic book series called DC Universe Online. The first six issues had special covers one could only get with the digital issues. According to Hank Kanalz, the senior vice president of DC's digital operations, the company is debating whether to make these covers available for a limited time only, which would effectively make this the first digital comic collectible. "Our attitude right now is that there is no point to limiting the number that are available. If there are more people who want it, then why not make it available to everyone," Kanalz said, speaking of the company's digital marketing strategy in general. "But technology changes at a very rapid pace." Ultimately, Kanalz believes there is an appetite for digital comic collections, but these will be different than physical collections in certain key ways. "There is a collectible aspect to purchasing comic books digitally from a 'gotta catch 'em all' point of view, but with physical books, there is also the value proposition that you can keep it or sell it back later," Kanalz said. "That's a little different for digital. Everything is always in mint condition." Virtual goods have quickly emerged as a multibillion-dollar industry, with consumers flocking to spend real money on intangible items such as swords for online games and flowers as gifts for friends on social networks. Many of these social gaming sites, including Zynga, Playfish and Crowdstar, offer "limited edition" virtual goods one can buy only for a limited time, or that require a player to earn a certain number of points, effectively creating that sense of scarcity and, perhaps more importantly, status. "Limited-edition virtual items are one of the creative ways that can be used to connect with the users by providing a sense of urgency, rarity and uniqueness in what can easily be a commodity world," said Peter Relan, CEO of CrowdStar, which has offered limited supplies of specially designed fish and animals. One thing that makes it easier for gaming sites to create true collectibles, according to Lehdonvirta, the Helsinki researcher, is that these goods cannot be copied as easily as music files since they are part of a game, rather than a stand-alone product. Indeed, it's likely we will only see more of these kind of collectibles. "The more time a user spends in these virtual worlds, the more important it becomes to differentiate themselves from others and have a set of accessories to distinguish their lifestyle, just like in the physical world," says Raymond Burke, the founding director of Indiana University's Customer Interface Laboratory. Even companies that don't usually produce digital goods may be able to benefit by creating a unique digital product for the consumer, as demonstrated recently by Hipmunk, a start-up travel website. Earlier this year, the company decided to boost user engagement by offering to have an artist create a custom-made digital portrait for fans who mentioned Hipmunk on Facebook. The picture featured a cartoon rendering of the fan's face on top of the company's logo of a cute chipmunk. According to Alexis Ohanian, head of marketing at Hipmunk, 500 users took the company up on its offer in the first 45 minutes, and the offer was capped after that. But it led to a 568% increase in Facebook likes for Hipmunk, helping build their brand. Meanwhile, Hipmunk users got to feel that they had gained a unique memento from the company. Other businesses could just as easily apply this formula, which Ohanian says took only one week to implement.